Government and defense spending, excluding education, comprises 30% of US GDP, and about 8% of jobs. It is the next largest industry sector after for-profits, by dollars and jobs, where foresight work is done. US defense spending is around 5% of GDP. Government and defense have the longest history of any industry sector of formally looking to the future, but they also do so unevenly, and with a focus that may vary with each political administration. Internationally, some geopolitically embattled, reasonably wealthy, and planning-oriented governments and defense departments (e.g. those of Finland, Singapore, Taiwan, Israel, South Africa, and recently, the UK and the EU) have made strong historical commitments to fund governmental foresight research, though how well this research is used to educate leaders and guide policy is far less clear. As mentioned in Chapter 1, the US government began its own large-scale foresight research with Herbert Hoover’s Committee on Social Trends, which was formed a few months before the Great Depression (how’s that for a socioeconomic wildcard!). As its main product, sociologist and technology analyst William Ogburn produced the 1568 page Recent Social Trends in 1933, the first major 20th century US government project to find social and technological trends and indicators to inform policy, and something of a return to the pioneering social foresight work of European governments done in the 1850s. The 1940s saw the creation of the first independent foresight think tanks, the non-profit RAND Corporation and SRI, oriented mainly to defense and government clients. The first internal defense and government foresight centers also emerged during this time, at places like the Office of Naval Research, DARPA, USAF, and USDA. Long-range science, technology, economic, and social foresight work also grew quietly and steadily from the 1940s on, fueled by growing Cold War hostilities and the Space Race, with its spectacular Sputnik-to-Apollo era achievements. Like the New Deal 1930’s before it, the 1970s were arguably the US’s most recent era of Peak Foresight for government foresight activities. 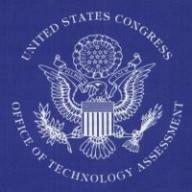 This era saw the 1972 formation of the nonpartisan US congressional Office of Technology Assessment (OTA), a fact-finding service which produced ~750 assessment studies on a wide range of science, technology, and policy topics for legislators and the public, studies that collected and transmitted expert foresight on those topics in a nonpartisan manner. The OTA was defunded in 1995, a victim of growing congressional polarization. In 1974, the House Select Committee on Committees even legislated that each standing committee in the US House of Representatives must “undertake futures research and forecasting on matters within its jurisdiction,” an unfunded mandate that fortuitously remains law today. This optimistic era also produced Anticipatory Democracy, a term coined by futurist Alvin Toffler, for democratic decision making, institutionalized foresight, and efforts at collective prediction of future events by a participatory and educated electorate. See Toffler’s Future Shock (1970), Clem Bezold’s, Anticipatory Democracy (1978), and most recently, Leon Fuerth’s Anticipatory Governance (2012), for more on this pioneering governance model, which seems likely to be a big part of our long-range future. The National Intelligence Council (NIC) was also formed in 1979, to brief the president with daily geopolitical foresight. This intelligence work eventually led to NIC’s Global Trends report, now published in both classified and unclassified form every five years, with a fifteen-year foresight horizon. Global Trends is a leading example of good publicly-funded long-range foresight work, and every foresight professional would do well to at least skim the latest report every five years. Unpleasant as it may be to consider, the central issue influencing government foresight since the 1970s has been the rise of corporatism, or growing corporate size and influence relative to government size and influence. Such work is also greatly influenced by the growing income inequality we’ve experienced since then in the US and many other industrialized democracies. See Aftershock (2010), Drift (2013), The Great Deformation (2013), The Price of Inequality (2013), The Shock Doctrine (2008), The Unwinding (2014), Why Nations Fail (2013), Winner-Take-All Politics (2011) and Capital in the Twenty-First Century (2014), for some recent accounts of this process. In Chapter 1 we mentioned a fact that illustrates just how radically our governance environment has changed over the last half-century. It bears repeating here. In the 1950s, less than twenty of the top 100 revenue-generating entities in the world were corporations, and the rest were countries. Today, more than eighty of the financially largest entities are corporations. The greater size and scale we have allowed to our corporations over our governments, in our civilization’s present era at least, has changed the nature of democracy in many significant ways. For one US example of changes that have ensued, in the Eisenhower administration in the 1950s, the marginal income tax rate for personal incomes over $3M/year was 91%. If you didn’t channel your income into new entrepreneurial business, the social expectation was that most of your nonentrepreneurial annual income, above a relatively high annual return, should go to address the problems of the society that allowed you to make all that wealth. Today, the effective tax rate for the typical ultrawealthy American ranges from 20-35%. As investor Warren Buffett noted in 2012, today he is taxed at a lower rate than his secretary, and most ultrawealthy and all corporations are today taxed at a lower rate than middle-class households in the US. The progressive income tax of 1914, originally introduced as a redistributive force in our economy, has been slowly dismantled and refashioned to its present state as a mildly regressive system, transferring new marginal wealth (productivity growth from year to year) from the middle class to our most wealthy citizens and to corporations. 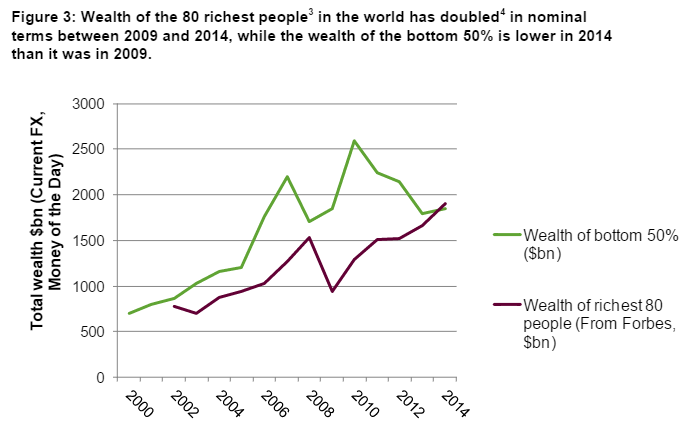 In their annual report Wealth: Having it All and Wanting More (2015) Oxfam now estimates that the richest 1% in the world own 48% of global wealth, leaving the other 99% of us to share the remaining 52%. 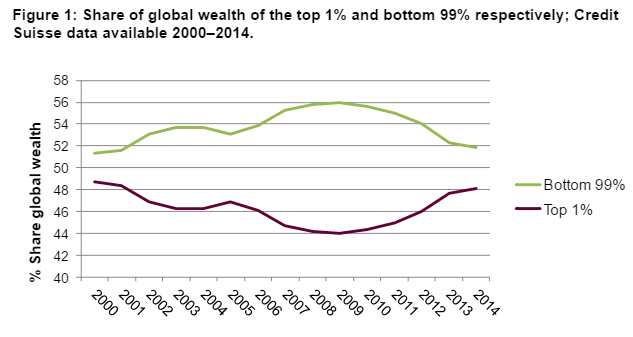 After decelerating for a decade, the wealth of the 1% has been accelerating again since 2010 (Fig. 1, Oxfam 2015). 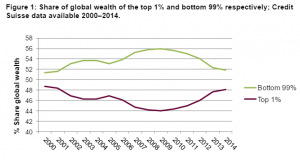 If present trends continue, circa 2020 just 1% of humanity will control the majority of global wealth. That’s quite disturbing, but the income and asset inequality are even more staggering at the very top. 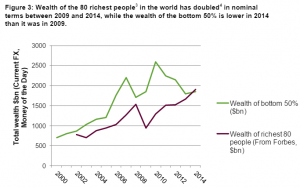 Oxfam found that the 80 wealthiest tycoons in the world (the top 0.000001% of humanity) now control as much wealth as the bottom 50% of us (3.5 billion human beings). This particular inequality has also been growing since 2010 (Fig. 3, Oxfam 2015). Oxfam found the financial, insurance, and health sectors have been the dominant suppliers of this billionaire’s wealth. Many economists have observed that these particular sectors are legally and structurally rigged, in many countries, to eliminate competition and public ownership, and transfer monopoly wealth to the owners of capital. An excellent and damning report is Gilens and Page’s Testing Theories of American Politics: Elites, Interest Groups, and Average Citizens (PDF) (2014), in which two Princeton and Northwestern U. scholars compared 1,800 US policies enacted from 1981-2002, empirically determining that the US is now an oligarchy, enacting policies which rarely align with the preferences of the majority of Americans but instead favor large special interests serving economic elites. Fortunately, this dismal state of affairs is unlikely to be permanent. Folks who care about social justice and inquality, which are the vast majority of voters in social democracies, will soon have powerful software agents modeling our values, goals, and preferences. These smart agents/assistants, which we’ll investigate later, will increasingly help us to read, watch, buy, vote, and yes, reform our countries in ways that reflect our personal values. My thesis, and prediction, is that whenever machine intelligence grows in democracies, not only will social transparency and quantification of social processes grow, but political representation must always grow as a direct function of the access of individual voters to that intelligence. Furthermore, while corporatism and plutocracy have risen strongly in the last sixty years, this process is also at least partially on a pendulum (a social cycle), as documented in the Kuznets curve for income inequality. Plutocracy in the US was even more extreme in the late 1800s, and the invention of antitrust and the progressive income tax in the 1910s and 1920s and redistributive social programs of the 1930s to 1960s moderated many of the economic disparities created by 20th century industrial capitalism. We can expect new economically democratic policies and programs to emerge again in the 21st century, but it may be a few decades yet before that occurs. US middle-class relative wealth and power most recently peaked in the 1940s-1950s, at the end of the Industrial Age. Middle-class power has eroded since, and we are still in the early years of even more rapidly wealth-creating Information Age capitalism. As Dennis Johnson observes in No Place For Amateurs (2007), registered lobbyists outnumbered US Congress members 60 to 1 in 2005, and lobbyists still outnumber elected legislators by over 20 to 1 since Obama’s lobbying reform rules in 2009. For decades now, corporate lobbyists, via wealthy-owned associations like the conservative American Legislative Exchange Council have written most federal and legislation drafts, rather than Congress, which has mostly lost that capacity, and our elites have strong incentive and ability to keep increasing their legislative control for the foreseeable future. The US’s constitution is also less democratic, or politically representative, than many newer democracies, such as the Nordic democracies discussed in Chapter 1, South Africa, and other parliamentary democracies where the parliament’s ability to vote “no confidence” for any executive leader is a major check on inevitable long-term growth (due to the law of accumulation) in presidential power. For more, see Dahl’s excellent How Democratic is the American Constitution? (2003) and Smith’s The American Anomaly (2010). As evidence and education grow in any democracy we can expect governance reform, but such change is always slow and hard to predict. All this said, there are still many bright spots of government foresight efforts today, both in the US and elsewhere. The White House’s Office of Science and Technology Policy (OSTP) and Office of Social Innovation and Civic Participation (OSICP) are just two of several new executive departments that engage in pioneering foresight work and leadership. The US Government Accountability Office (GAO) also regularly publishes foresight and accountability reports, such as 21st Century Challenges, by US Comptroller General David Walker (1998-2008), a particularly well-known recent financial foresight leader. The DoD’s Quadrennial Defense Review, and the Dept. of State’s Quadrennial Diplomacy and Development Review are also longstanding examples of permanent government foresight processes, and there are scores of minor ones. Like all sectors, government feels the pinch of austerity phases during economic recessions, and government’s rebound from austerity can take longer than in the private sector. But as wealth has grown in our industrial democracies, there is now more money than in previous decades for doing foresight work for our leading state and local governments, and more urban and community foresight work going on, in total annual dollars spent, than ever before. Perhaps our most dramatic new governmental trend in the US, growing strongly since 9/11/2001 in the US, and widely expected to be on at least a twenty-year upcycle from this point forward, is our intelligence and defense community’s expenditures on homeland and international security. For example, the US National Counterterrorism Center (NCTC) is budgeted to double in size between now and 2022. Many new civil liberties issues are created by this new surveillance, intelligence capacity, as the 2013 global surveillance disclosures of Edward Snowden have begun to explore. But increasing global public transparency is also widely acknowledged as our most powerful way to make a secure world. As with other forms of power, the question for democracies is how much of this transparency is top-down surveillance, pointed at small actors, and how much is bottom-up “souveillance”, pointed at powerful actors. For more bottom-up driven examples, think of accounting and reporting rules for public and private firms, journalism, mobile phones with cameras, and crowd-driven initiatives like Wikileaks. For every democracy, some kind of productive balance between these two social forms of transparency exists. The best security in open and innovative democracies continually advances both types of transparency, but always favors bottom-up initiatives, to keep civil rights adequately protected. An excellent book that makes this case is David Brin’s The Transparent Society (1998). In coming decades we will see powerful new predictive foresight capacities resulting from all our new top-down security-related government spending. Palantir and other defense-funded predictive analytics intelligence platforms, New York City’s Domain Awareness surveillance system, military and security drones, and a Military Internet of Things are just a few governance-related areas where foresight will be pioneered. With regard to bottom-up global governance, we must also mention the many new transnational defense, economic development, and governance bodies (ASEAN, AU, EU, IMF, OECD, NATO, UN, UNASUR, World Bank, WTO, etc.) created in the post-WWII period. Viewing humanity from a planetary perspective, we seem just now to be getting wealthy and smart enough to create both functional transnational governance and foresight. The EU in particular has pioneered and funded a broad set of regional foresight initiatives in recent years. We are also seeing a rise in state, county, and city governments as centers for both aspirational long-range planning and legislative innovation, and thus new state governance experiments and new social data. Though it may follow an uneven path and is subject to increasing competition from private actors, governance foresight is a noble calling with a bright future.